Meet your new ultra-efficient workspace! The pull out return on this roll-top desk can be conveniently stored away inside the Amish desk to make for a convertible office hub. 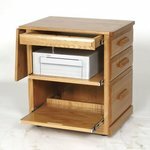 Quality craftsmanship shines through with dovetailed drawers, raised panel sides, and full extension drawer slides that have a capacity of 100 pounds. Your convenience was considered throughout every step of the construction process. 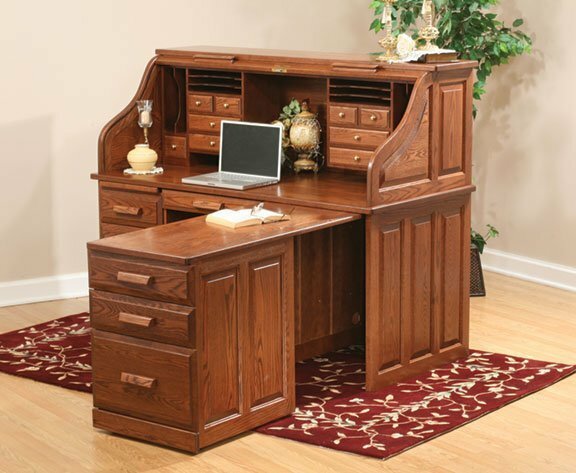 Our woodworkers are dedicated to providing your home office with exceptionally functional and attractive Amish furniture. Store your computer tower away conveniently in the knee hole of the desk in order to free up crucial cabinet space. The pull out return gives you additional room for a printer, scanner, or storage yet can be easily tucked away when no longer needed. Everything has its place in our Amish Computer Roll Top Desk. This rolltop desk is expertly crafted of solid wood in the USA! Choose the optional top drawers for added storage space. The desk drawer bottoms of the rolltop desk are solid oak plywood and the panel sides are raised. This desk piece is solid wood with a 1" thick frame. Choose from an array of options including cherry, walnut, and hickory. Each of these hardwoods is handpicked and sourced from America. We'd love to answer them! Our friendly Amish furniture experts are here to assist you in making your office furniture vision a reality. Please get in touch by calling 866-272-6773. Thank you for shopping with DutchCrafters. Overall Width of Return with Drop Leaf Up: 41"
Return Width With Drop Down leaf Down: 23"
Return Inside Depth: 16 1/2"